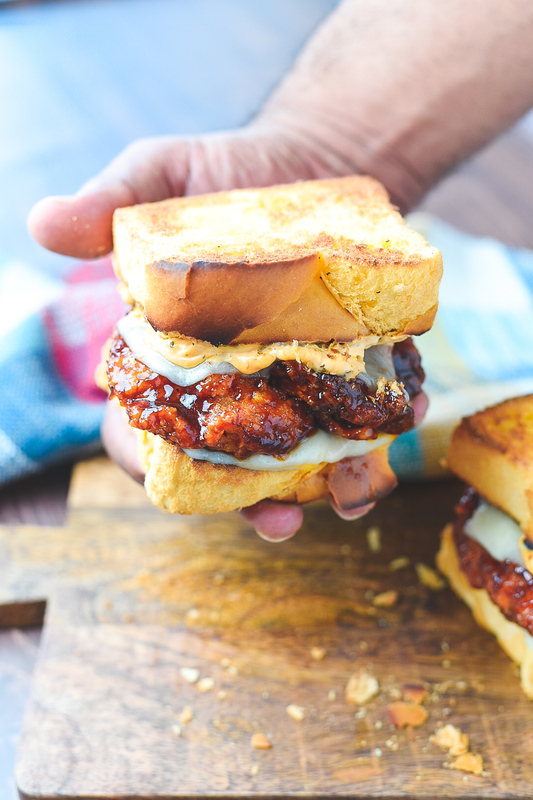 One of my favorite sandwiches is their Honey BBQ Chicken Strip Sandwich and that is where this latest recipe was inspired from. Now Texas is known for it’s BBQ so I figured how could I go wrong with crispy chicken tenders on buttery Texas toast. And since I was in the mood for a good crispy chicken manwich, today is all about my Crispy BBQ Chicken Strip Sandwich. The crispiness you get from the flour and panko mixture is like having your bases loaded with your best hitter on deck in a baseball game. 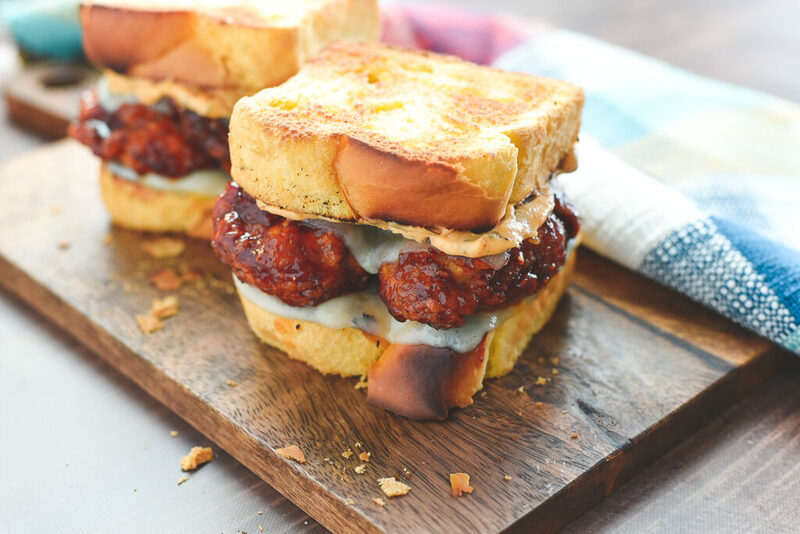 The grand slam comes into play when you add the sweet and tangy BBQ sauce and the buttery Havarti cheese to this bad boy. The Sriracha mayo adds a little heat and the final step surrounds all of this goodness with toasted Texas toast which is made from sliced brioche bread. Who wants a Crispy BBQ Chicken Strip Sandwich? Raises hand. 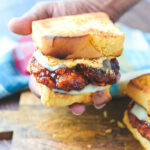 If you are like me with trying to avoid fast foods but still want to satisfy that craving that comes every now and then, give this Crispy BBQ Chicken Strip Sandwich a try and I can almost guarantee you and the family will have this recipe on repeat! Begin by rinsing the chicken breast and slicing into strips. (For shorter strips I cut across the width of the breast with at least 1 inch of thickness). Season sliced chicken breast with paprika and set to the side. In a bowl, add eggs and buttermilk then whisk. In one large zip lock bag, add 1 cup of flour. In a separate bag add 1 cup flour, 1 cup of panko, 1 tsp garlic powder and 1 tsp black pepper. Mix together. Sprinkle the chicken breast with 1 tbsp of flour to slightly coat, dip chicken into the egg mixture then add to the flour only bag. Shake to coat well. Remove from bag, add back into the egg mixture, then into the panko bag mixture. Shake to coat well. Pre-heat a small cooking pot to medium to low heat, add butter, and allow to melt. Add BBQ sauce, brown sugar, turmeric, 1 tsp black pepper, 1 tsp garlic powder. and lemon juice. Stir for 5 minutes then keep on simmer for a later step. In a separate cooking pan, pre-heat to medium heat and add 2 cups or more of cooking oil. 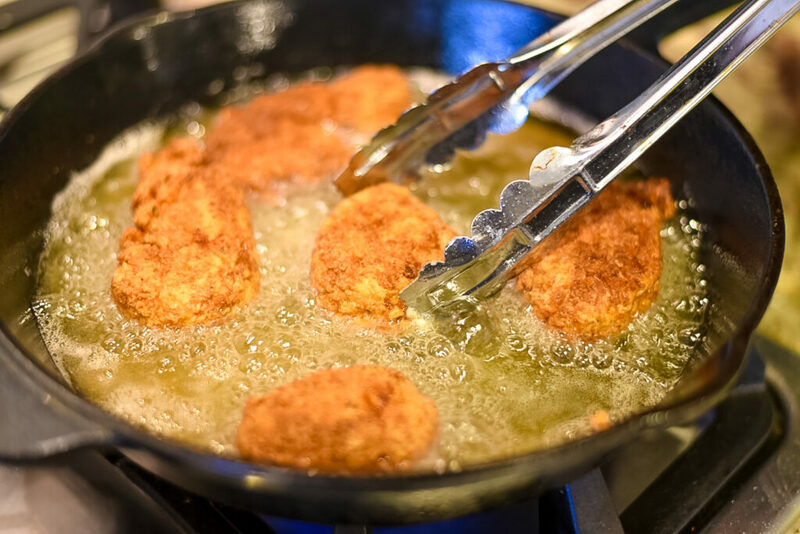 Once the oil is hot, add chicken breast and cook for 4 minutes on one side and 3 minutes on the other then place in a large bowl. 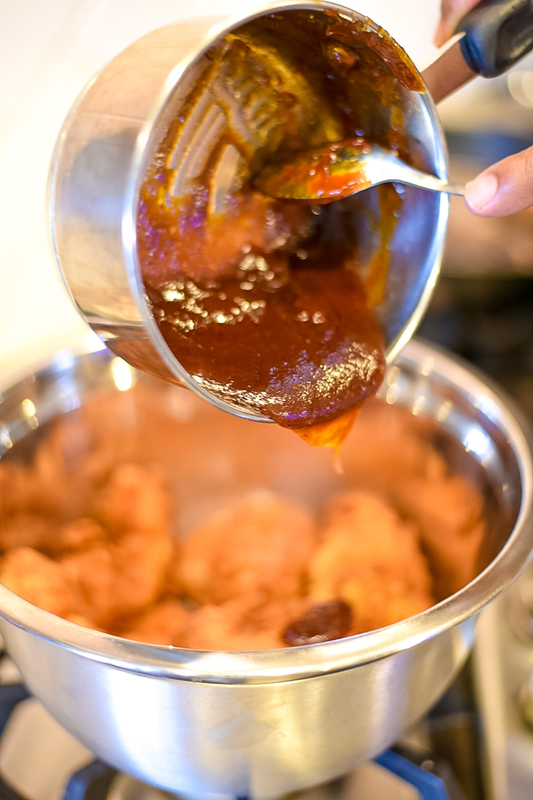 Pour BBQ sauce over fried chicken coating well. Slice the brioche bread into Texas Toast sized slices, spread butter to one side and broil in the oven until slightly golden. Place 1 Havarti Cheese Slice onto the inside of the bread, add chicken strips then another slice of Havarti Cheese. Place back into the oven for a few minutes until cheese begins to melt then remove. For the secret sriracha sauce, add mayo, white pepper, crushed basil leaves, garlic powder, Sriracha Sauce then stir. Add to one slice of the bread slice then place on top of the sandwich. Serve hot. 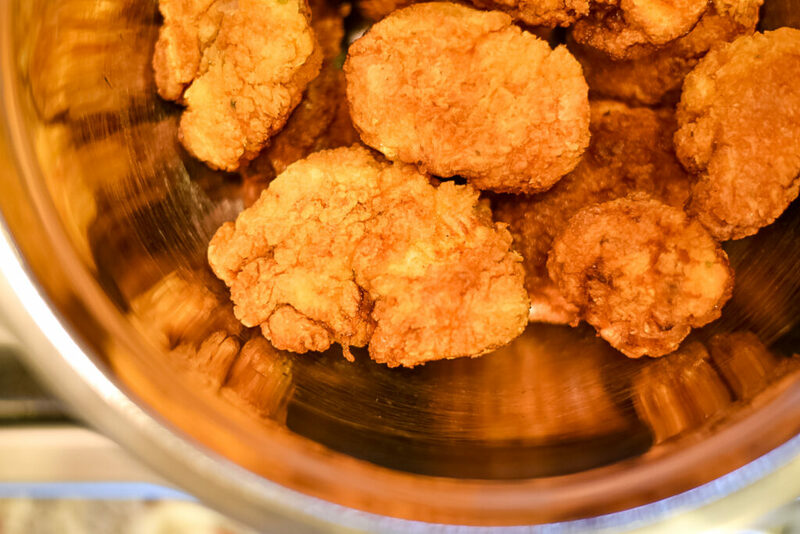 For the amount of cooking oil to be used to fry the chicken, make sure the oil covers at least 3/4 of the chicken strips. That sandwich looks to die for! It looks so juicy and saucy!! I totally want one right now!! Thanks a lot Beth I truly appreciate it! One for the weekend. Thanks for sharing. Thank you I appreciate it. I think you would really enjoy this one. Thanks so much Ramona! I really appreciate it! 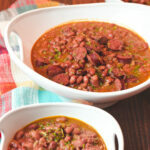 But seriously, that looks really good, and we’ll need to be making some of it, and probably a few other recipes of yours! LOL that facehole line is hilarious. Thanks a lot I really appreciate it. 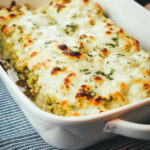 Your photos made my mouth water. I would so love this sandwich right now! Def one to try! Thank you Jacqueline! you would really enjoy this one and if you decide to give it a try please let me know how it comes out.